My son is an eager eBay trader and had a large bunch of parcels to post. Being an empathic human being (most of us are) I decided to help him out. I took eleven parcels and headed to the local post office – which just happens to reside in the back of the local grocery store. Truth be told I don’t particularly like going to this local post office because the grocery store is rather dull, the people behind the counter don’t greet anyone coming into the store and I have to navigate around people and shelves to get to the post office counter and inevitably there is queue. This time I timed it perfectly and there was no queue. The woman behind the counter greeted me with a smile and we struck up a conversation – a plain old-fashioned conversation. I shared that I was helping out my son who loves business – buying, selling, dealing with customers, earning a fair reward for his risk taking and hard work. She went on to tell me that she knew my son, that he’s such a gentlemen, that he helps out at the local charity shop, that he is likely to be a millionaire. What really touched me was “You should be proud of him!” Our conversation took around fifteen minutes – it takes that long to ship eleven parcels. By the time I left the place we were both smiling and each of us wished the other well – genuinely. I am still smiling inside and out and I can clearly picture that woman in my mind and she has a place in my heart. My ten year old daughter turned 11 this week and where did she want to go for her evening meal? McDonald’s. So that is where we headed and when we got there (around 7pm) it was almost empty. Whilst my daughter was ordering for the family I was busy taking in the look and feel of the ‘restaurant’. I got the green, healthy thing by looking at the furniture and the menus. I also noticed that the seating area was smaller as a young childrens play area had been put into one end of the store. Whilst I got that the place was in tune with ‘green, healthy, children, family’ mantra I could not help but notice that it felt cold. With the food trays in our hands we headed to the seating area where the five of us could sit together – two on either side (on the wooden benches) and one to the side on a round stool. Getting seated was harder than you might imagine. I had to navigate around the round stool and slide onto the bench on one side of the table. It was not easy, I struggled – there was not enough room between the bench and the table! Then we found that we could not place our food trays on the table. Once I got past my frustration I realised that McDonald’s had reduced the width and the length of the tables. And reduced the distance between the tables and the wooden benches on either side. I did not enjoy the eating experience and was delighted when we left. Whilst I was doing some consulting work in Ireland I stayed at a Radissan SAS. The hotel was ideally placed for work – only twenty minutes walk from the client’s offices. The bedroom was clean and spacious. The hotel had free wi-fi, room service was prompt and the hotel staff were friendly and helpful whenever I approached them for some request. So why am I writing about them? What are the some of the key moments on the customer journey? Let me suggest a few: arrival and check in; getting a good nights sleep; breakfast and dinner; and checking-out. I noticed that each time I came to check in (it was in the late evening) there was no-one at the check-in desk and no instructions on how to get hold of someone. On several occasions there was no-one to ‘great me and seat me’ for breakfast and dinner. Yet, what ‘upset’ me the most was not being able to get a good nights sleep. Why? Because I found that the pillows did not work for me. I could not help thinking why the Radissan does not offer the option of different types of pillow. Lesson 3: customers hire you to provide services, figure out what these services are (it is not that hard, really) and get them right including building in flexibility so that you can treat different customers differently. I rang up Santander to request a new chequebook and pretty quickly got through to a friendly chap. He was patient and friendly with me whilst I walked about the house finding all the stuff I needed to get through the security details. When I mentioned that I was not in a hurry but I might be driving up his AHT we told me to relax and take my time. And we talked about call-centres – he works in one and I help improve the way call-centres work to improve the customer experience. Once he had ordered the chequebook I was ready to say thank you and hang up. My friend on the other end was not finished. He had noticed that I had failed the IVR security check and so he asked me if I wanted him to send me over new security details that would allow me to navigate the IVR. He went further and told me how I could work the IVR in case of certain scenarios – information that I found useful. Most of all I really appreciated that he was helping me rather than selling stuff to me. Lesson 4: put yourself in your customer’s shoes and provide information, advice and tools that help your customer – do this without being asked, sense the need/opportunity and resond appropriately. I order the wrong PC fan from Amazon and did not have time to send it back and wait for a new one. The issue was not the fan but the connector. So I headed to the nearest PC World superstore and started to look for a converter – something that would allow me to convert a three pin into a four pin. I found something that looked like it might work. Wanting to make sure that it did work I headed to the service/repair desk and asked for help. The chap on the other side of the desk was cheerful and helpful. He categorically assured me that it would work so I opened the bag an tried fitting the converter onto the fan – it did not work. The chap behind the desk got into action. He left his counter and went looking for other converters. He found one and told me that it should work – I opened the bag tested it out and it did not fit. The friendly chap recognised his mistake, took his time and found another converter. He was categorical: this will work – no doubt about it. I tested it out: it should have worked but it did not work the designs were compatible but bits of stuff got in the way and so the converter would not fit onto the fan cable. The friendly chap was not put off – he went to work and found another converted. This time he opened up the bag and tested it out with my fan. It worked! I thanked him – truly grateful for his help – and left the store. Next time I needed something I headed to that exact store and looked for that friendly chap. Lesson 5: don’t assume, check – build a prototype, try it out, check what does and does not work, refine until it does work; and remember what should work in theory does not necessarily work in practice. Lesson 6: if you want to cultivate gratitude and generate repeat business then focus on being totally committed to helping your customer get his needs met. Last week I needed to withdraw some money from my mortgage account and move it into my current account. It should have been an easy process as I have done it many times. Yet, I met a problem: I had forgotten my e-banking login details as I had not logged into my mortgage account for a couple of years. As this was something I needed to do urgently – on that day – I rang Santander Customer Services. I got through to Customer Services pretty quickly and came face to face with the IVR. Thankfully it was easy to grasp. I selected the right option and pretty soon I was through to a female customer services agent who dived into the security check: date of birth, postcode, mortgage account no, monthly payments…… Once she had verified all that she needed to verify she asked me how she could help me. I told her that she could help me by transferring money from my Santander mortgage account to my Santander current account. I expected that she would say “No problem.” She didn’t: she told me that I had to send in a letter requesting this transfer. “How is it that I can and have made these transfers through e-banking and yet you cannot do this for me over the telephone?” That was my question. She told me that it was company policy. She did not explain why it was company policy; I could have told her that company policy was stupid but didn’t after all she is simply an insignificant little cog in a huge machine who simply follows orders. “Can you please put me through to someone who can help me recover my e-banking login ID so that I can make this transfer through e-banking?” There was a pause along with a flat, emotionless, “Yes”. I took that to mean yes I will do that but it is really not my job to help your figure this out. Instead of being transferred to the right team she told me that I had to ring the e-commerce team and gave me their phone number. Well I rang the ‘e-commerce’ team no and was faced with the IVR. I listened to this once, listened to it twice and then I listened to it a third time. There were several options but not one that was relevant to my needs. I tried to get out of the IVR and get through to human being and found that I could not: the same useless options ended up being relayed again and again! Frustrated, I hung up. I really needed to move that money so I dived into my banking file meticulously and eventually found my login ID. It took me about 30 seconds to log in and then another 2 minutes to complete the transfer. Thank the heavens for e-banking! No wonder e-banking is so popular in the UK: it allows us to bypass the indifference and incompetence of the big UK banks. Maybe I am being harsh. The system has probably been deliberately designed this way so as to influence customers (like me) to self-serve through e-banking. Companies don’t care about customers they care about competitors. The British banks act as an oligopoly doing business exactly the same way: each delivers lousy customer service as it is not necessary to do better. Customers know this and continue to stick with the bank they now bank with; I will continue banking with Santander. The banks will only change their behaviour when a viable competitor enters who has no investment in the existing way of doing business. If you look closely at other industries you will find that many of the companies embracing ‘customer experience’ are doing so because of the competition in their industry / marketplace. If you want to improve the customer experience then start with company policies. Company policies are like the rules of chess: change the rules and you change the game. If you take a good hard look at your company policies you are likely to find that they are not customer friendly: they are one of the biggest obstacles to designing and delivering attractive customer experiences. Your customer facing staff should explain company policies in the right way. If you are going to have policies that cause ‘pain’ for your customers than you have to train your staff to explain these policies in a way that makes sense to your customers. What is the direct/indirect benefit to the customer of this policy? This is something that you have to think through and explain to the customer. IVRs can be a blessing or a curse. Well designed IVRs are a blessing because your customers does not have to wait a long time to get to a human being. And using human beings to route ‘calls’ is not the best way to use human beings. However, too many IVRs are poorly designed from a customer viewpoint. If you are putting in an IVR make sure that it is thoroughly tested before it is implemented to take account of all the scenarios. What mechanism do you have in place to figure out which IVRs are badly designed? People have higher standards of people than technology. Technology is either easy to use or it is not. Technology works or it does not work. Technology is not personal – it does not leave us feeling invalidated and offended. We do not expect technology to ‘own and solve our problem’. When it comes to people it is the opposite. We recognise that people are human and they make mistakes: we can and do forgive mistakes. We do not tend to forgive people who are indifferent to us and our ‘pain’. If people do not treat us the way that we expect people to treat us then we get upset. And then we look for another supplier. Yesterday I read an interesting article on self service (well worth reading) and this got me thinking about my recent experience with the Home Delivery Network, a parcel delivery firm that operates in the UK. 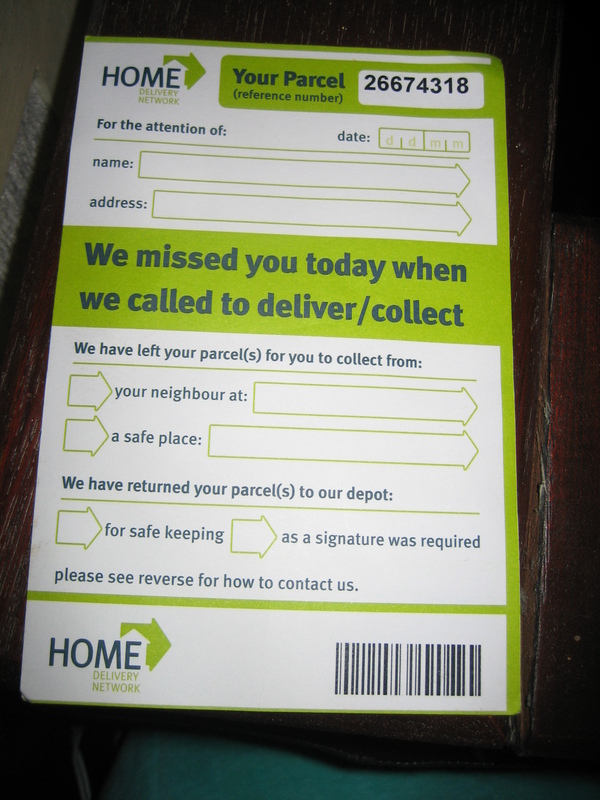 what had actually happened to the parcel – taken back to the depot or left with a neighbour etc. What I did notice was 8 digit parcel ID and the instruction to look at the back of the card for contact details. Reading the back it became clear that I was being urged to go to the website. I did exactly that and entered both the parcel ID and my postcode. The website responded with the following message: “Your parcel(s) cannot be rescheduled for delivery, please contact customer services on 0871 977 0800”. Just to make sure that I had not made an error, I had a second go at entering the parcel ID and postcode and found that I got the same message. So I called the number and found that straight away (no waiting) the IVR kicked in and once I had entered the parcel ID it spelt out when I could get the parcel delivered. As it was a Tuesday, I requested delivery on the Thursday and left my home number so that delivery firm could ring me back if there was an issue. At this point I was happy with the experience as it had been easy to schedule a delivery. Thursday arrived and departed: we did not get the parcel delivered and we did not get a phone call to let us know that there was an issue. So I contacted customer services (the IVR) and proceeded to listen to the option and select another date for delivery. That date came and went: no delivery, no phone call. Then I made a third attempt and met the same fate. At this point I became rather frustrated even angry. Why? Because I wanted to get my hands on the parcel and I could not. Every time I dialled the customer services number I found myself faced with the IVR which spelled out the dates when I could reschedule delivery. I was wondering: how do I get through to a human being who can help me with my problem? Then I made another attempt to contact customer services. This time I listened to the IVR and did not opt for any of the delivery dates and found that right at the end I was given an option to speak to a human being. I selected that option and found myself talking to Kylie. She greeted me warmly, took my details, looked at her system and was able to tell me that the parcel was addressed to (my wife) and sent by Republic (the clothes retailer). Kylie also told me that the delivery drivers handheld had failed and so he had not been able to upload the information into the system. As a result I had not been able to find and reschedule the delivery of the parcel. Then she went on to tell me that the notes on her system were telling her that the parcel had actually been delivered the very first time. And clearly that might explain why I had a lack of success in getting the parcel delivered! When I told Kylie that my wife and I had not received that parcel (despite what her systems said) Kylie went on to clearly explain what I need to do. She was great and she completely changed my mood and my attitude: she took away my frustration because she had shed light on my situation and provided me with a clear path that I needed to follow to close the matter out. Above all she had a friendly, helpful disposition throughout our conversation: she made me feel that she was on my side. If you consider my experience, you find that the driver left the card behind even though he had delivered the parcel according to Kylie. Second, the delivery driver did not fill in the data fields in the card: either he should have filled in the data fields or the data fields should not be there. Third, his handheld failed to update the data into the delivery tracking system. Fourth, the IVR allowed me to schedule a delivery even though there was no parcel to be delivered as it had already been delivered. At first I jumped at the idea of rescheduling the parcel delivery through a website. Why? Because, in the past I have had to make a number of calls and/or wait a long time to have delivery depots answer my calls, find my parcel on their system and then reschedule a delivery. Even when the website did not work, I was happy to use the IVR to schedule the delivery as it was quick and easy. It is necessary to give customers an easy to find option to bypass the self-service technology. Why? Because the self-service technology can fail and does fail as it did in my case where neither the web nor the IVR was able to tell me that there was no parcel left to deliver or to deliver that parcel. In my case, I made four failed contacts with the delivery firm before I was able to figure out how to get through to a helpful human being – a customer services agent called Kylie. Also because not all customers can or want to use self-service technology. A case in point is the UK supermarkets replacing cashiers with self-service tills where the customer has to do the work of the cashier. I am in that segment of people who do not agree to the proposition that I should do the work of the supermarkets especially as the two times I have made the effort the process has not worked and I have had to wait for one of the supermarket staff to come over and sort out the issues. Why? Because human beings are usually the best at dealing with and sorting out the problems that you create for your customers through the introduction of self-service technology. This is where Kylie was great: she simply defused by frustration and anger by listening to me, getting where I was at and then helping me through to the solution. At a recent conference I heard several female customers mention that whilst they appreciated the ease and convenience of banking electronically with First Direct they did not feel any emotional bond with First Direct because they never spoke with a human being. This points to a truth: whilst technology can make life easier it rarely makes human beings feel acknowledged, appreciated, respected, valued. This is why I love Kylie: she made me feel all those things when the self-service technology had left me feeling insignificant, neglected and helpless. I had the misfortune of having a problem that really needed to be fixed yesterday – the earlier the better. So I found myself on the phone and after selecting the right IVR options I was told “Your call is in a queue and will be answered as soon as possible” and this recording kept being replayed every 10 – 20 seconds. The first time I hung up after six minutes – partly because I just could not stand to listen to the recording. The next time I rang I was listening to this recording for four minutes. What do I find so irritating about this recording? Being British I queue – I have been doing it for many years and it is second nature to me. In the real world when I queue I make that choice. My choice is based on observation and calculation: I observe the length of the queue; I observe how quickly / slowly the queue is moving; and I calculate how long it is likely to take me to get served. Based on that calculation I make a decision: to queue or not. I found the recording irritating because it did not provide me with any useful information. Information that I needed to make a decision – hold whilst making a cup of tea or hang up? It did not provide me with a sense of progress e.g. ” You were 10th in the queue, you are now 2nd in the queue”. Why is it so hard for people who are in the business of serving customers to act on insights that have been around for over 50 years? Insights that show the human need for control – to be in control of his/her life. Insights that show that one of the best ways to inflict considerable pain on a human is to put him/her in an environment over which he/she has no control. Martin Seligman (psychologist) even coined a term for it “learned helplessness”. It is hard because the people who authorised the recording are not thinking of customers as human beings. They are used to operating a factory: a factory that processes calls. To the managers of these factories what matters is to deal with the calls in way that minimises costs. In a factory there is conveyor belt and your call is on the conveyor belt. And they want to let you know that they will process your call as soon as possible. The focus is on them and their internal operation not you the human being and your needs. That does not make these managers bad human beings – they are simply trapped in a factory mindset where you process objects. A final thought: this incident shows the importance of paying attention to the basics before embarking on the ‘strategic’ stuff. For a customer there is nothing more ‘strategic’ – important / critical – than the way you treat her when she reaches out to you for help.